My girlfriend Michele’s mother passed away yesterday morning. This post is being written in her memory. May Alley was born in Liverpool, England in the 1930s. As a young girl she lived through the horrors of World War II, as the Nazis inflicted their terrifying Blitz upon Great Britain. Following the War the UK experienced a severe economic depression, and May came to the United States in the 1960s to look for work. Living in New York City she married and eventually gave birth to Michele. Michele and I have been a couple for almost eight years now. I was fortunate enough to meet May on a number of occasions during this time. She was a very sweet woman. I was often reminded of May when I read the historical novels of London-born author Victor Pemberton. I initially knew of Pemberton from his work as a writer and script editor on Doctor Who in the late 1960s. In fact, Pemberton has had a very diverse career in television, radio, and documentary films. Our Family opens in London during the First World War. Letty Edgington meets Ollie Hobbs, a soldier recuperating from wounds sustained on the French battlefield. Letty and Oliver fall in love and, despite their very different socioeconomic backgrounds and the objections of their families, marry. The novel follows their lives over the succeeding decades, through both good times and bad. Pemberton invests his characters with real humanity. They are very much living, feeling individuals. No one among them is all good or all bad; Pemberton succeeds in finding redemptive qualities in even those people who at first glance would seem completely unlikable. He delves deep into the minds and souls of Letty, Ollie, their families and friends, revealing what motivates their actions, giving us a real understanding of who they are. For me, one of the most striking aspects of Our Family was the chapters set during World War II. I am Jewish, and so when I was growing up I learned about the Holocaust. Additionally, in college I minored in History. From my classes on European history, as well as outside reading, I gained some knowledge of the events of the War. 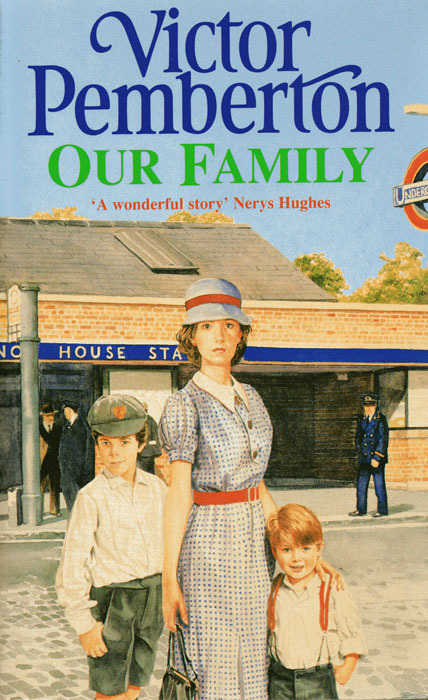 But, truthfully, I never truly understood the terrible experiences on the Home Front in Britain until I read Our Family. Pemberton’s depiction of the Hobbs family’s struggles to survive through five long years of almost-daily air raids by the Nazi Luftwaffe and subsequent rocket attacks on London, seeing their beloved city turned to rubble, watching innocent civilians die in the terrible bombings, is incredibly powerful. Pemberton communicates all of this in a way that the matter-of-fact text and still photographs of a history book can never achieve. I was left with a profound admiration for the British civilians who endured half a decade of the horrors of war. I also came away from Our Family with a realization of what Michele’s mother went through as a young child as Liverpool was bombed, and an understanding of how decades later May could still be traumatized by those events. Pemberton chronicles the story of Letty, Ollie, and their children through to the late Twentieth Century. When I reached the end of the novel, it was a sort of bittersweet experience. Throughout the course of the book, I had gotten to know the characters so well, and I was reluctant to part with them. I almost felt like I knew these people personally. “As I’m sure you have gathered, I myself lived through the horrors of the London blitz, and it is a period in my life that I shall never forget. In many ways, writing those fifteen saga novels, most of them set during that war, has been an attempt by me to exorcise those terrible times from my mind, but the memories still linger, especially the dark moments of sudden death in one’s own family, and the appalling destruction wreaked on the civilian population. Pemberton’s novel is a stirring narrative that left me deeply moved. I highly recommend it. 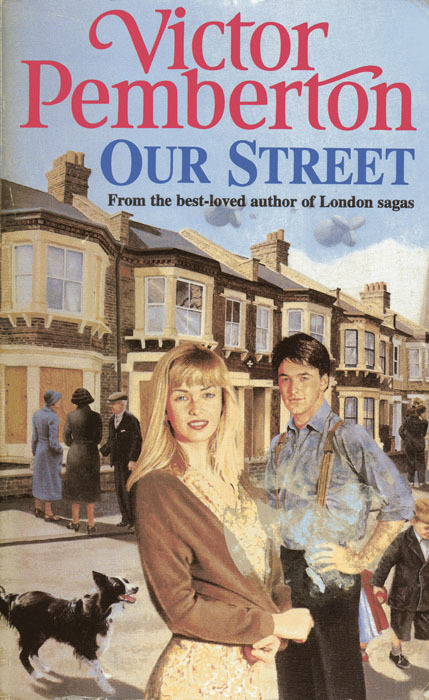 The second book in Pemberton’s London saga, entitled Our Street, is also a very heartfelt work. The novel chronicles the friendship between Elsa, an elderly German Jewish refugee, and Frankie, a teenage boy (a fictionalized version of Pemberton himself), in 1940s London. Although it is not quite as easy to find a copy of Our Street here in the States, it is worth tracking down, as well. A number of web sites have used copies for sale. By accident I purchased two different copies of Our Street through used online booksellers. I gave one of them to May, who was a voracious reader. Michele subsequently informed me that her mother had enjoyed the novel, and that it reminded her of her own childhood. I hope that I was able to bring her some small measure of happiness with that gift. It has been a few years since I read both Our Family and Our Street. I hope to have the opportunity to read them again in the near future. Pemberton’s rich writing is well worth experiencing a second time. Usually I do not re-blog someone else’s post. The exception is that yesterday morning, my own mother passed away. This blog, posted by Ben Herman, is in tribute to my mother. My own thoughts will be posted later. I am very sorry to hear about the passing away of your girlfriend’s mother. Thank you for sharing and introducing me to a great new writer. I am unaware of how much hardship the English endured during WWII and these novels will be a great resource that as you say can bring the events more to life in narrative form than in dry factual non-fiction genres. Moving piece, Ben. Poor Michele.